Towards the end of December, I headed to Cape Town with a group of friends for New Years. The best part about it – one of my best friends from the UK came down too. We had a mere five days to see each other, and, in and amongst the catching up, everybody had an agenda of things they wanted to do. 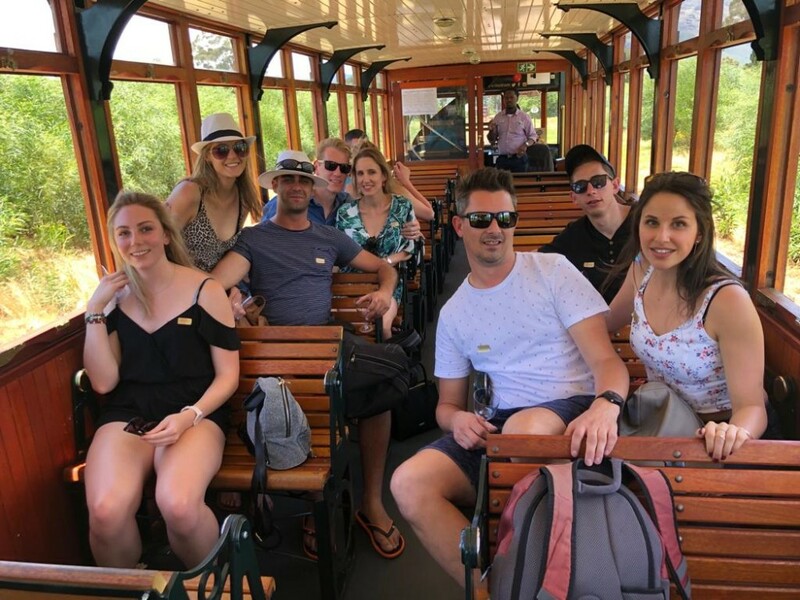 Holidaying with ten people meant it was difficult to agree on what to do, which resulted in a lot of splitting up throughout the trip, but we had all agreed one experience – the Franschhoek Wine Tram. Who can possibly say no to a tram, which goes from wine farm to wine farm, while passing breath-taking scenery and picturesque vineyards? All that you really have to do is pick your preferred wine route, sit back and enjoy the rolling mountains. 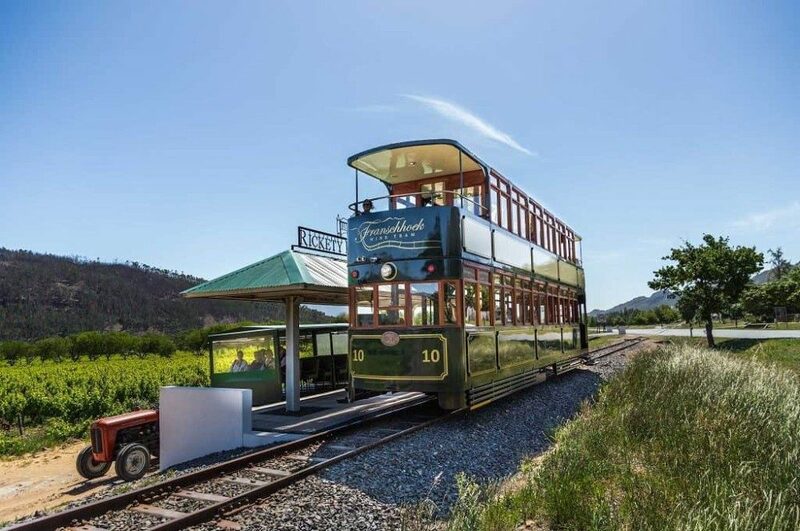 Franschhoek Wine Tram currently offers eight hop-on, hop-off lines to choose from. 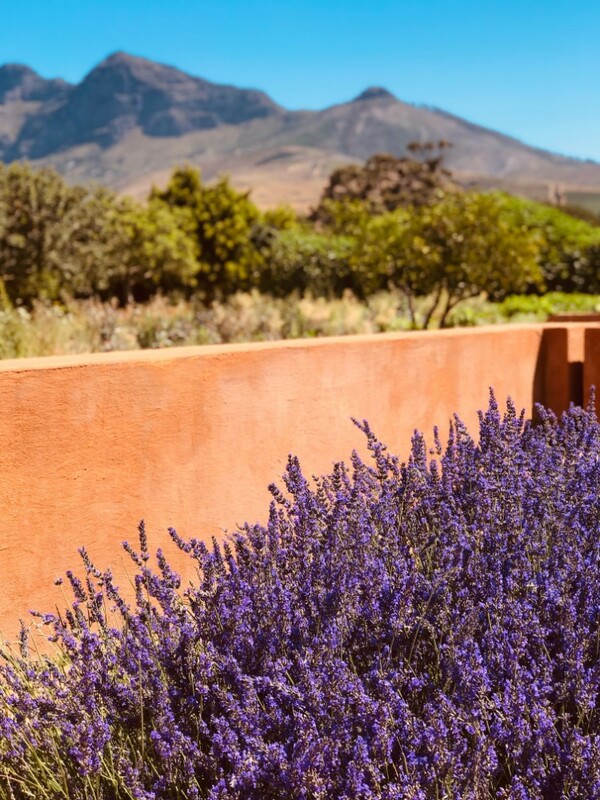 Each line visits eight wine estates and will show you a separate part of the Franschhoek Valley. We selected the Orange Line, which included a journey on a double-decker railway tram and a tram-bus. 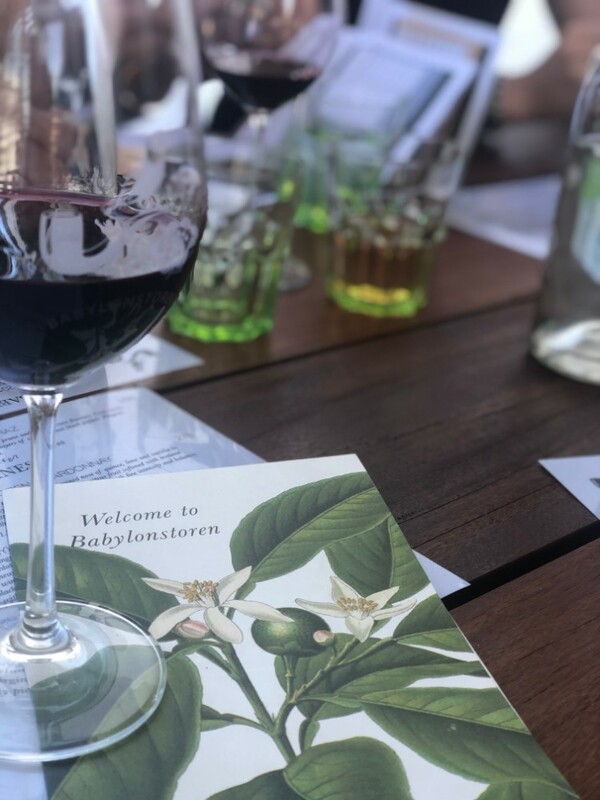 The tour stops at Noble Hill, Babylonstoren, Backsberg, Vrede en Lust, Plaisir de Merle, Allee Bleue, Solms Delta and Boschendal. 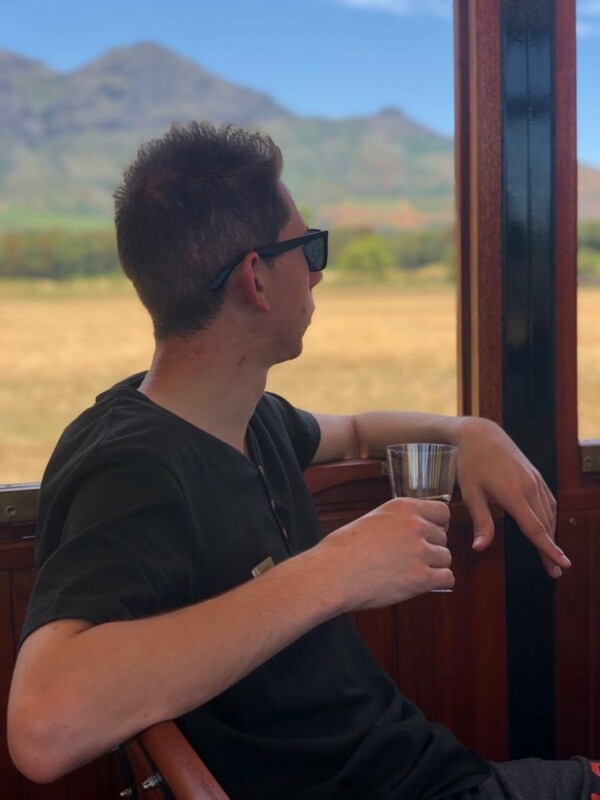 The cost of our tour was R520 because we chose to book through the Red Bus City Sightseeing company, as we did not want to drive to Franschhoek if we were drinking. 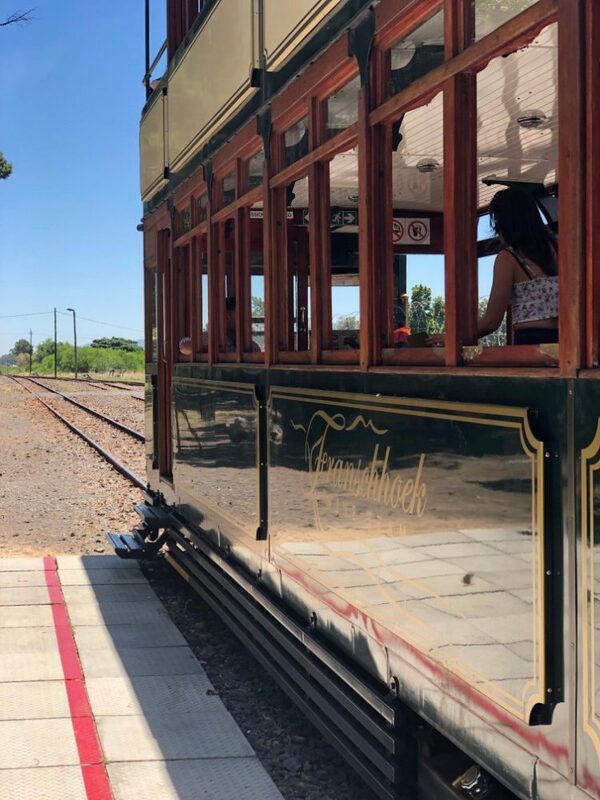 However, if you would prefer to book directly with the Wine Tram (currently the price is R240), and drive there or take an Uber you can of course do so too. 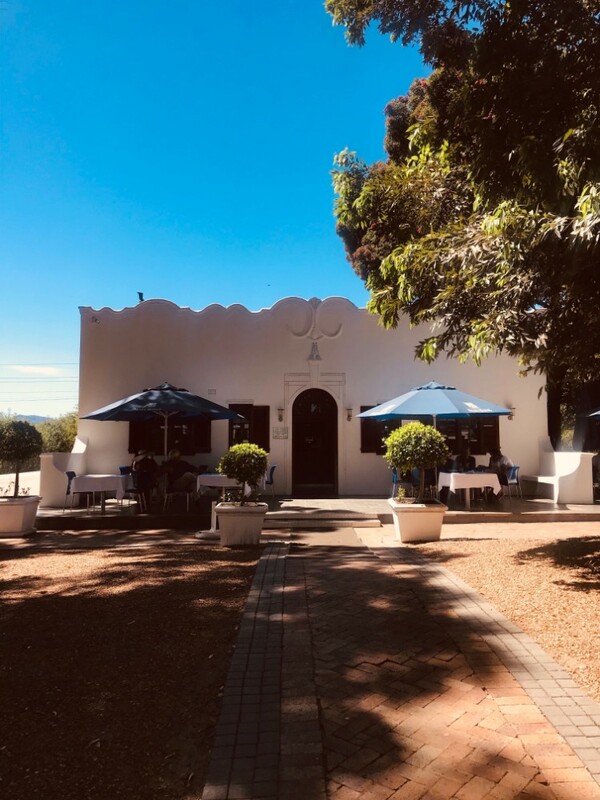 After about a 40-minute bus drive, which was extremely comfortable – we arrived at the Wine Tram Station (Franschhoek Square). As soon as we saw the tram, we were excited – it was a beautiful green and gold colour, with large open windows. On the Orange route, you alternate between an open-air tram and tram-bus, as certain routes are off the path of the tram. However, this should not deter you, as the bus looks exactly like the tram from the inside – and to be honest when you are drinking wine to your heart’s content it isn’t the biggest concern. We hopped on the open-air tram-bus for the first stop and headed to Allée Bleue. Our tour guide was Rael, who aside from having a ton of information about each wine farm, was also very hilarious. As soon as we got to the first farm, half of our group decided to head in and get tasting. The other half (me) decided I needed breakfast before wine, so we headed straight to their bistro to line our tummies. 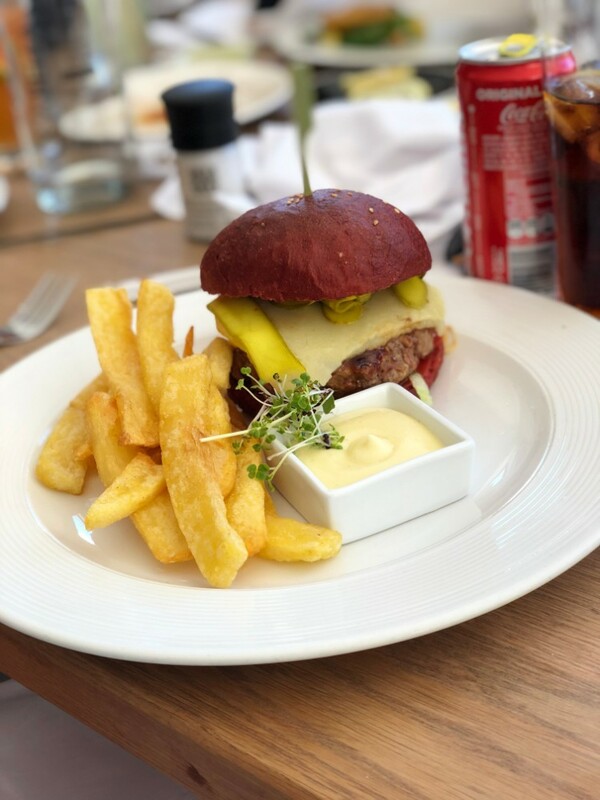 Bistro at Allée Bleue has something for everyone’s taste buds. 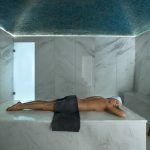 It offers an à la carte menu and is open for breakfast and lunch. We all had an egg breakfast and some of Allee Bleue’s champagne to kick the day off. After about 35 minutes, a tram-bus picked us up and we met up with the other half of our crew, who seemed to have already enjoyed quite a lot of the wine on offer. Then we were off again, whizzing through the beautiful countryside and valleys making our next stop at Solms Delta. This second stop was a fascinating wine farm and had a museum on the premises, with all kinds of information about the first inhabitants of the area and the heritage that comes with it. 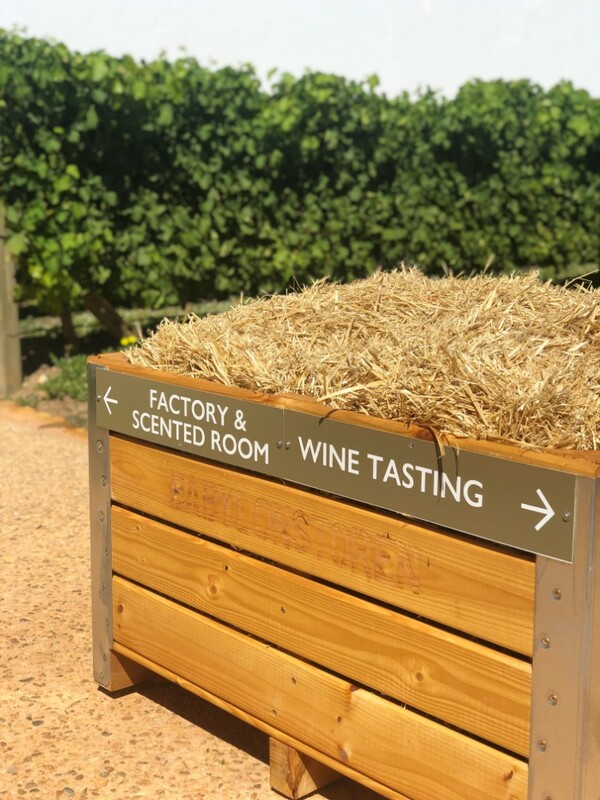 At every stop, there is an opportunity to do a wine tour of the farms, however I would advise booking beforehand. We sat down under the shade of a beautiful lush tree and started our first wine tasting together. Over the course of about 45 minutes, we ‘sampled’ (I use that term loosely as our waitress was very generous) their Shiraz, Rose and Chenin Blanc and then on to their famous Africana. This bottle of vino contains a whopping 15% alcohol content! I am no wine connoisseur, but it tasted of cherries, woody and slightly sweet. It is by far the best wine we tasted on the tour and we all purchased a bottle to take home. At this point, things started to get a little foggy. We all got up to pay and to catch the next tram, but we did not all end up on the tram. Half of the group got distracted by the vineyard. Me, being one of the most punctual people you will ever meet was on the bus-tram, ready for the next stop. Little did we know it was going to be impossible to catch up with each other on this tour – especially when drinking! Once you get off at a wine estate, it is, depending on the route you have chosen, either one hour or 35 minutes before the next bus or tram collects you. 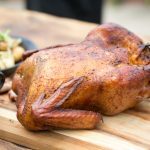 You can of course stay for an additional hour or two at any of the wineries, but this means you will need to forfeit another winery along the way. We stopped at Boschendal to drop some other tram patrons and pick up some new guests. 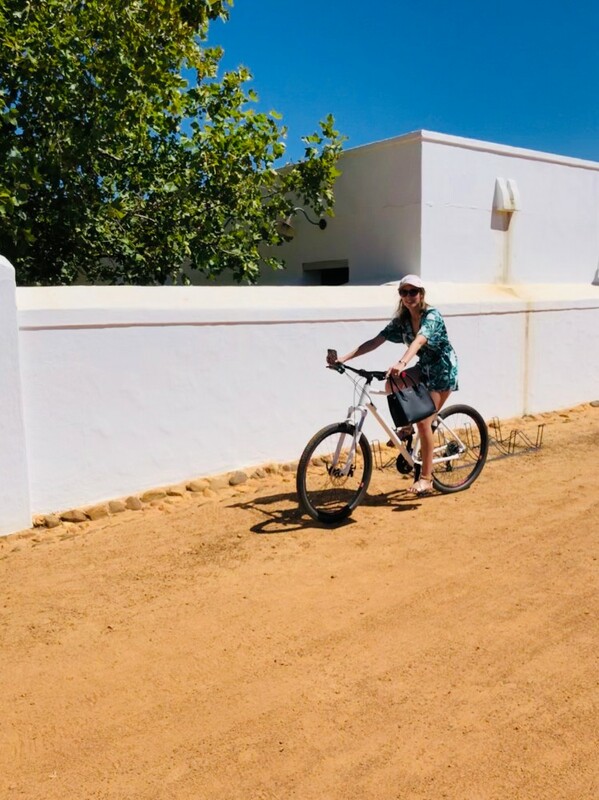 As we headed off from Boschendal, Rael asked – “Did you enjoy the tour so far?” and I was feeling the effects of the wine at this point and screamed “YES, amazing” only to realise that he was talking to the people who had just got on. The tram exploded in hysterical laughter. Vrede en Lust was the most beautiful estate in terms of scenery for me. As we got there, Rael warned us that he had a twin brother who would be taking over the tour and that we shouldn’t be alarmed and think that we were seeing double. We headed to our table, but I was distracted and stopped halfway to watch a chef make beetroot buns. I needed a break from all the wine so I ordered a gin slush, which was very refreshing. Shaun and I had ants in our pants and needed to see Vrede en Lust, so we started walking around their beautiful gardens. I stood in awe at the mountains and especially the way their fancy doorway frames the spectacular view. If you have a few hundred thousand floating around, I really recommend this spot as a wedding venue! 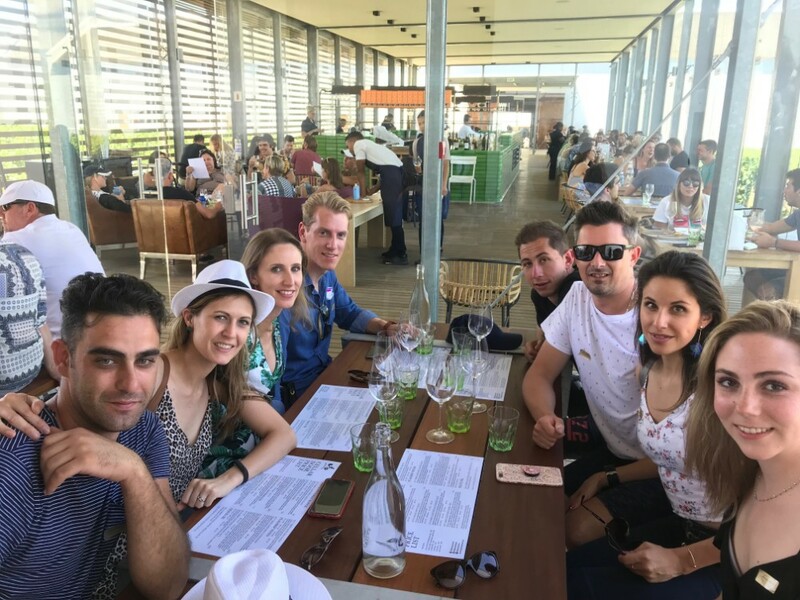 I tried again to call our friends – but they were definitely well into their wine tasting experience by now (George was rattling on about making new friends and was not listening to a word I was saying). I tried to tell them we were heading off and they said they would try to meet at the next farm. At this point, I had given up hope as it was like trying to herd cats. We jumped on the tram and headed to Babylonstoren. To be honest the only reason I wanted to go there was that I wanted to see their massive cacti garden. I am a sucker for beautiful succulents and cactus pictures. 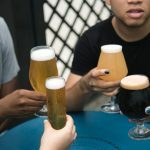 Nobody else understood my fascination with these plants and wanted to drink first – so we started with another five tasting glasses. Once the wine tasting was over, everyone agreed it was time to see the famous garden I had been rambling on about. On the way, we saw some beautiful lavender gardens, a veggie garden as well as their famous restaurant ‘Babel’. However, we soon realised we would never make it back in time to catch the tram back if we went to see these Cactus (the tram is very strict with time and will leave you behind). With only a few minutes to spare, we started running back – which was quite hysterical because of all the wine we consumed. Halfway back to the tram, we found bikes, which distracted us for a further five minutes. Eventually, we found our way back to the tram (this wine farm is HUGE) and low and behold, Rael’s identical twin brother Robin welcomed us on board. He took us to the tram and it was time to make our way back. Even on the way home, we were treated to beautiful scenery and views, as well as some very tipsy antics from fellow wine tram patrons. Then somewhere between Babylonstoren and the station – we bumped into our long lost friends. We all just started laughing at how hilarious it had been trying to find each other and discussed at length what wines we had tasted. 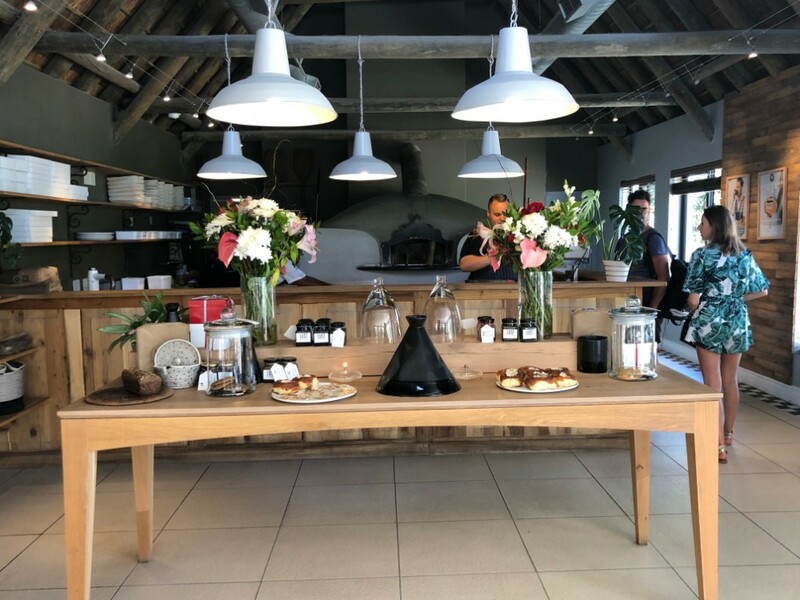 We had apparently missed the best fudge tasting at Plaisir de Merle. I made a mental note that I had to do this route again. After we arrived at the station, we boarded the Red Bus back to the V&A and within a few minutes, everyone fell asleep! 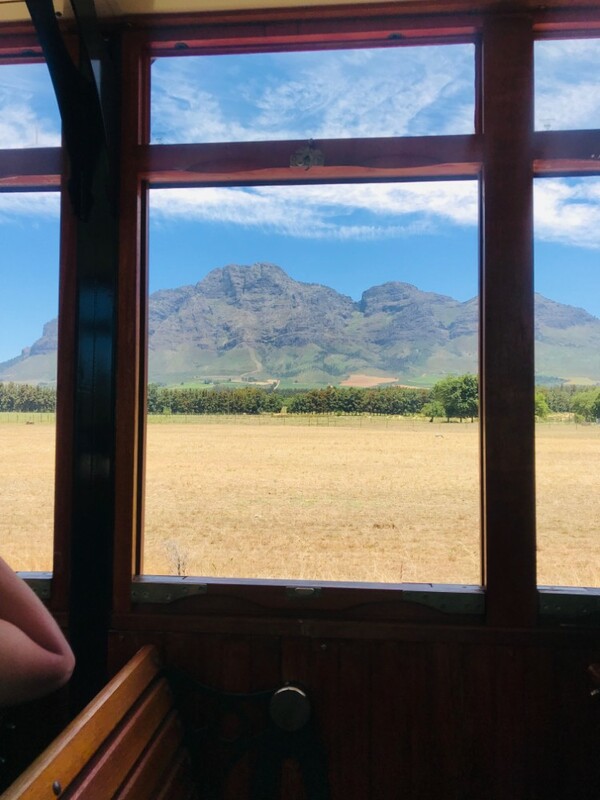 For me – the Franschhoek Wine Tram experience is an absolute must if you are in Cape Town. Awesome memories made and I would highly recommend booking this tour on your next visit to Cape Town! Thank you to the Franschhoek Wine Tram and City Sightseeing Tours, I will definitely be back!